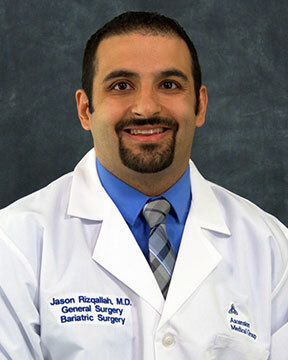 Jason Rizqallah, MD, is a bariatric surgeon with Ascension Medical Group. Dr. Rizqallah is board-certified in general surgery with a focus and passion in bariatric surgery. He provides bariatric procedures to morbidly obese patients seeking surgical weight loss options. Dr. Rizqallah has a special interest ... Read More in minimally invasive techniques including advanced laparoscopic procedures. As a bariatric surgeon, he performs the laparoscopic Roux-en-Y gastric bypass and the laparoscopic sleeve gastrectomy. Dr Rizqallah also performs General Surgery, upper and lower endoscopies and he has a particular interest in abdominal wall hernias and has experience with robotic hernia repairs. Dr. Rizqallah is a member of the American Society for Metabolic and Bariatric Surgery. Outside of the office, Dr. Rizqallah enjoys spending time with family, traveling, and being a Detroit sports fan. Jason Rizqallah, MD offers services at multiple MI locations.